Buckingham Notables: Thomas S. Bocock | slate river ramblings . . . . According to the Biographical Directory of the American Congress, 1774-1949, Thomas S. Bocock, was born on May 18, 1815 in the part of Buckingham County which now lies in Appomattox County. In Virginia gentry style, he was first educated by private tutors, graduated from Hampden-Sidney College (1838), then studied law and was admitted to the bar (1840), practicing at Buckingham Court House. He entered politics as a Democrat and was elected a member of the Virginia House of Delegates (1842-1844). He served as prosecuting attorney of Appomattox County (1845-1846) and was elected to the U.S. House of Representatives, serving from March 4, 1847-March 3, 1861. At the outbreak of the Civil War, he became a Representative to the Confederate Congress and was the Confederacy’s only Speaker of the House (1862-1865). 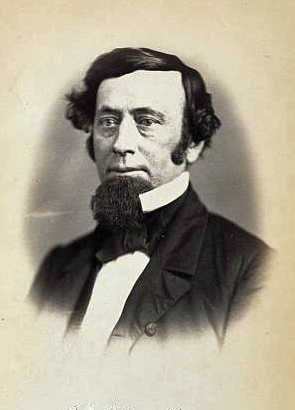 Following the war, he served again in the Virginia House of Delegates off and on until 1878. Bocock died in Appomattox County on August 5, 1891 and was buried the family cemetery, at his plantation, Wildway, located north of Appomattox Court House Is it true that Bocock named his plantation after his goatee? His middle name was Salem. Following is the listing from the list of Alumni found in “General catalogue of the officers and students of Hampden-Sidney College, Virginia, 1776-1906,” p. 76. 1837-38-Bocock, Thomas Salem, A.B., A.M.; lawyer; Va. Leg. ; U.S.H.R. ; Speaker Confed. Cong. ; planter in later life; died in Appomattox county, Va., in 1891. Buckingham Houses: Woodside | slate river ramblings . . . .